In a Mystery, there’s always Adventure! The Mystery of Journeys Crowne is finally revealed in new Book. Children’s Book Author and Illustrator, K. Michael Crawford brings to you one of Bazel Lark’s greatest unsolved mysteries in a book called “The Mystery of Journeys Crowne”- An Adventure Drawing Game. Mr. Lark, an Archaeologist and Explorer, discovered the one Golden Key that would lead him through a series of clues in order to finally answer the mystery behind Journeys Crowne. Although, it is sad to report, Bazel was never able to solve this mystery. In following in Mr. Lark’s footsteps, the reader must answer clues on each page in order to draw the missing elements on the page. Once the reader has completed all the pages, the mystery behind Journeys Crowne will be revealed. His most notable find to date was the remains of Jimmy Hoffa discovered in the Tomb of Sir Isaac Newton, which Mr. Hoffa’s remains are now on loan to the Chicago Mafia Museum. Many of his other great discoveries, The Treasure of Tabuyo and Headdress of Cleopatra’s hand servant are housed at the Bazel Lark Museum in Mystic Shores. On the other hand, K. Michael Crawford still remains a mystery. 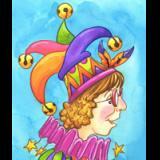 The Mystery of Journeys Crowne- An Adventure Drawing Game. © 2008 K. Michael Crawford All rights Reserved. This highly unusual picture book promises an adventure, and it delivers. however, it requires the reader to draw many pictures along the way. It is also filled chock full of hints in codes. Did I say codes? The way is absolutely inundated with them. Some are easy partial substitution codes but many others are much more complex. Some have hints or solving instructions and many do not. In fact, some are not readily recognized for what they are. This book is not only fun, it is designed to stretch the reader’s mind further than a rubber band. cryptogram in the newspaper and at online puzzle sites. I can affirm that these codes are tough. If you buy this book for a child, don’t be surprised if that young person cries for assistance. Don’t be surprised if you have a difficult time providing it. Many of these puzzles and clues require a wide range of cultural knowledge. Take nursery rhymes for example: at what time did the mouse run up the clock? Or, did he run down then? Try reading a sentence that, like the Hebrew language, has no vowels, which must be determined by the context of the sentence. All that being said about its challenges, it would be a very worthwhile endeavor to work through the pages with a child and use each hard place as a learning moment. The exhilaration of solving a difficult step along the way and drawing pictures in the space provided (or on a plain sheet of paper) that cause the reader’s visual senses to develop is well worth it. We rated this exciting keep-them-quiet-for-the-summer vehicle a high four hearts. If childen are constant fixtures in your gallery, consider stocking The Mystery of Journeys Crowne, an adventure drawing game by author and illustrator, K. Michael Crawford. The book’s main character, archeologist and explorer Mr. Lark, wasn’t able to solve the mystery of the Journeys Crowne with the golden key he discovered. Readers answer clues and draw the missing elements on the pages of the full-color book, unraveling a series of riddles and challenges to solve the mystery. Artist K. Michael Crawford, a successful children's book and children's product illustrator creates whimsical and quirky paintings that lend a sense of waggish to all Michael illustrates. Michael's choice of bright colors create a playfulness about the work in which children love. Michael Crawford has a new book out called The Mystery of Journeys Crowne in which the reader must figure out clues in order to know what to draw on each page. Quite an Adventure to take to discover the Mystery behind Journeys Cowne. I was thrilled to see the rule of "no weapons". There is enough violence out there for kids to interact with and in return act out on. For them to use their imagination with out violence is a welcoming treat! The illustrations are breath taking with vivid colors and detail galore! I couldn't stop my two year old from stealing the book away from me. She pondered the artwork with a smile the entire time. Mommy had to read the book during nap time. I love the fact the book has a child use different methods of their imagination, reading, thinking and artistically. Then to add researching facts is like the cherry on top! Journeys Crowne was an exciting journey for our entire family! The book is on my Christmas shopping list for my 8 year old nephew. The sentence "A weapon free adventure " caught my attention. This book teaches children to solve mysteries with their imagination, not with violence. They are asked to use pencils, erasers, markers or pencil crayons to draw the clues directly in the book or they could use a separate piece of paper to solve the mystery over and over again. The reader is asked to stop the villain from taking over the world. The journey begins with beautifully illustrated pages filled with details. Each page gives clues in order to figure out what to draw in the empty box. If the reader doesn't know the answer they can work together with a parent by searching the internet or going the library. Solving the clues is like fuel for the mind, it sparks their imagination. I love this book and highly recommend this to friends and family! I was curious about a book that promised adventure and creativity without violence. The Mystery of Journeys Crowne came through on all of that and more. Each page is bright,inviting young minds to use imagination and logic for solving the puzzles. Here is a book that can build confidence in the budding artist as the reader navigates through the journey. Loved it, loved it, loved it! My 8 yo and I are really enjoying this book. As a homeschooling mom, I was looking for something that would challenge her to think logically while at the same time be fun enough for her to pick up and do on her own. Well, she has done that with this book. She loves the illustrations and solving the mystery and I'm pleased to have a beautiful keepsake of her younger years. We'll be buying a few more to give as birthday gifts to her friends and I'm planning on looking into the authors other books too. Get ready for explosive color and high adventure as you sign on to find the treasures of Journey's Crowne!! A smart, fun, kaleidesope journey awaits all in this delighful new drawing adventure that makes you think and become your own character in the story! 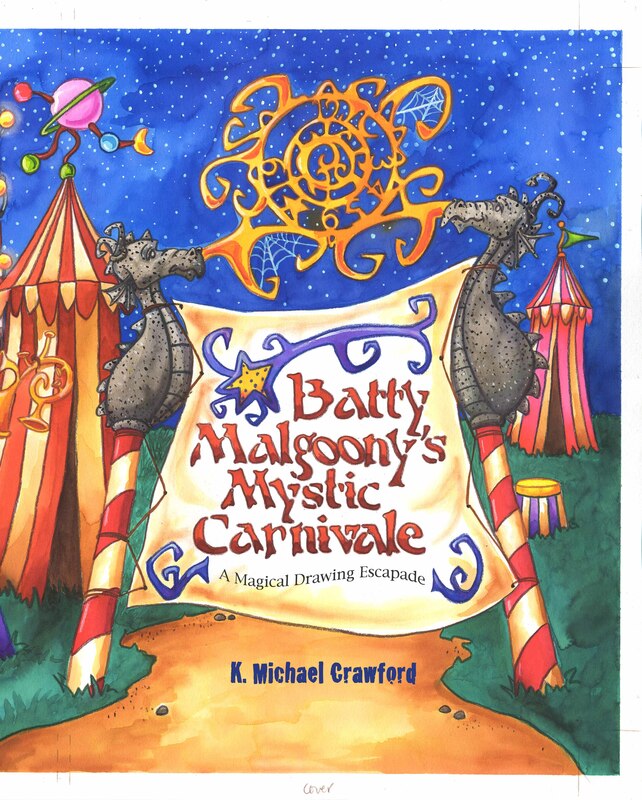 K. Michael Crawford has created a hypnotizing, witty and most of all.... fun for all book that parents and kids can share and no one will be disappointed! "The Mystery of Journeys Crowne: An Adventure Drawing Game" is a Bazel Lark drawing adventure/mystery book. Appealing to creative kids age 8 and older, this lavishly illustrated clue hunter's tome will fill hours of drawing and thinking time. Encouraging hands-on artistic talent development is what author/illustrator K. Michael Crawford does best. Readers and drawers will need a pencil, eraser, and markers or colored pencils to finish their embellishments. Young artistic sleuths must figure out each clue/solution in sequence, and they are encouraged to do independent research through the library or use of the internet to solve clues and make drawings. Readers agree to have a weapon-free adventure in the beginning. They must use their imagination to find ways to play and win the game with no weapons drawn (pun intended). Artists must also agree to Bazel's Creed, which includes "I agree to not use anyone else's answers and to keep my quest protected from those who wish to get there before me or I agree to kiss my mom in front of my friends." (Did I mention I love this book?) And then there's also "I agree to do my best no matter what or I agree to eat a worm." To summarize, K. Michael Crawford may be a mystery, but he certainly understands the soul and psyche of an eight -year-old! His most appealing book will encourage and hone artistic, creative, logical, research, and self-entertainment skills, not to mention promote positive, peaceful approaches to knotty problems like thwarting would-be world dominators! "The Mystery of Journeys Crowne" is the heartfelt answer to a violent video/computer games-beleaguered parent's prayer. It is also the perfect answer to the question, "What kind of child would you like to raise?"